OK. Not what I was shooting for – and it really needed another rev. After printing and sending it out, I now have a ton of stuff that I’d like to do to it…but, this season’s been so busy – this is what everyone got. Click it to view full-size. Truth is, tons of folks are readily mixing work and pleasure online. In fact, it’s been going on for years; I think it used to be called business networking, or something. Or, maybe just networking? I think the Social Media label throws the whole thing off – as if it were a new frontier. Also, it doesn’t help that a whole new breed of expert has cropped up; Twitter is crowded with self-proclaimed Social Media Mavens, for example. What will you bring to the space? It’s all up to you. Welcome to the Loyal Order of the Birdbrains. 1. You’re Not Comfortable with Your Personal and Work Lives Spilling Into Each Other. You haven’t discovered the concept of managing access to “those” photos on your Facebook. You regularly interact with social technology (phones, email, twitter, etc.) while in a state of diminished mental faculties. Or, maybe you just think it’s weird for your “work friends” to know your “non-work friends.” Maybe you wear a tinfoil hat and are really concerned about privacy, anonymity, and being an invisible, one-dimensional personality online. If this is the case, don’t tweet professionally. Several ill-funded, half-hearted, and poorly-thought out attempts to deconstruct “cool” or map the route from the underground to the mainstream have taught me that trying to peg the currency of community to one single attribute of communication. However, this Wired article does a fantastic job of boiling down what makes something particularly interesting and tying it to humor, of all things; community’s funny money, as it were. While just plain old listening is a big part of a TwitterPro approach, sooner or later you’re going to have to fire something back to show that you’re a real person; it’ll help if you can bring a smile to someone’s face. If you’re chuckle challenged, you may want to avoid trying to be do business in the social space. As we venture into a connected world as ambassadors for our brands, we should expect to be sought out for our knowledge of our companies, influence in our industries, and the products/services provided by our companies. As a worst case scenario, you could be someone who is solely in charge of “taking the specs from the customers to the engineers” but who’s assistant physically does your job, in all actuality. If you’re not interested in being contacted about work (thus actually creating more work for you, on some level) via a relatively open social network, you should probably avoid tweeting officially. 4. You Don’t Have a Blog or Somewhere Else to Continue the Conversation. On Twitter, there’s not a lot of space to editorialize or discuss. Confucius aside, substance and wisdom are hard to come by in 140 char… ! (That’s 140 characters, folks. Ideally you’ve got Facebook, a blog, a Tumblr thing, or some actual service platform where you can say more than … -6) Doh. 5. You Can’t Actually Help Your Company’s Customers. If you’re not willing to lend a hand, offer advice, point collegues and customers in the right direction, or even talk about work stuff, you may want to keep your tweets strictly casual. Now, the reality is that it’s very cute these days to get a reply from @zappos or some other CSR via Twitter. There are only a few million people on Twitter (here’s a blog post with a pretty interesting guess on this actual number.) I have a feeling that when the twitterverse population approaches weekly Walmart shoppers (in 2005, for example, it looks like 138MM folks wandered into Walmart every week), customer care via may not be so charming or novel. It should be interesting to see develop. I am sure “social business casual” will rule, for now…but, if you don’t want to be exposed for being completely useless at work via Twitter, don’t talk about work on Twitter. There you have them – 5 more reasons to keep to yourself and work less. Observing these easy guidelines, and there’s a good chance that you shouldn’t tweet professionally – inextricably mixing the “work you” with your personal social network. Whatever you want to call it, “Channel Me,” the Twitterverse…it’s all the same. It’s semi-professional business networking, and it’s been around a lot longer than bowling leagues. Since social technology has brought business networking to every swiveling task chair in the world, I wonder if the golf courses and bowling alleys are thinning out.Next up, my social media campaign to save analog, non-Wii leisure sports. Here’s a little talk I put together for a UX Meetup here in LA. It’s a bit of an amalgamation of emerging experience design tenets focusing on differences between page design and experience design. Probably not a giant eye-opener for folks that are currently engaged in Experience Design. I’ll offer up what I believe to be the missing subtext for the talk below – not a script; just some stuff that isn’t on the slides, to make it easier to understand. Originally, the context for this talk was an article I wrote for the FEED report, Razorfish’s Digital Design Outlook. The original title was “Putting Jakob on the Shelf.” Again, for experience designers, it seems like a pot-shot; most of us know Jakob Nielsen’s place in our pantheon of nerd-heroes. I guess the impetus came from quite a few client conversations that seemed to rush into page design as a primary vehicle for redesigning a web experience, to be specific. Pages are the old building blocks. We have square monitors, the Web was borne of hypertext documents, which are “shaped” like pages, pages date back to Egyptian papyrus, I suppose. Pages will probably be around for a while. With that in mind, when we design an experience, we design around the fulfillment of some human need. The truth of the matter is that these needs are very seldom solved via a “page”; folks are looking for fulfillment, conversation, connections, prices, comparisons, knowledge…that sort of thing. What I quickly narrow down to Answers and Entertainment is very seldom page-shaped – it’s smaller, and more fluid. I think that search has contributed to our page focus – as last-click attribution has placed the almighty index on a pedestal. Image and video search are a step in the right direction, I guess…but, as we map real engagements, we know that actual behavior is quite messy. Impressions across channels build up to actions, interactions, engagement, purchase, loyalty, etc. The last bit here, starting at Slide 16 and running through Slide 21, I guess, is a plea to all Product Managers, Marketing Folks, and other business stakeholders to start thinking about their products and projects in terms of experience and flow; narrative and interaction. 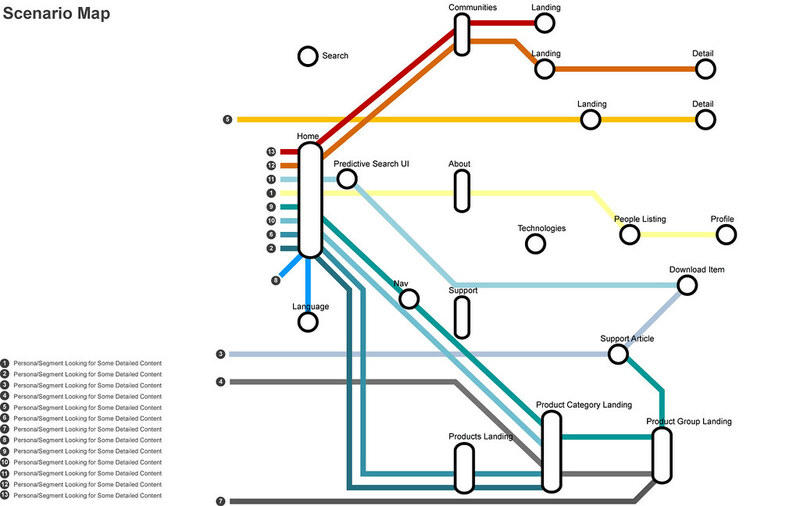 As much as everyone seems to love to agree with me on this point of “Don’t Start Design with a Site Map” – I still see an awful lot of it out in the space. My only point here is that we should use scenarios, narrative, lo-fidelity UI, and map those to a system – and let an aggregation of narratives define the solution. 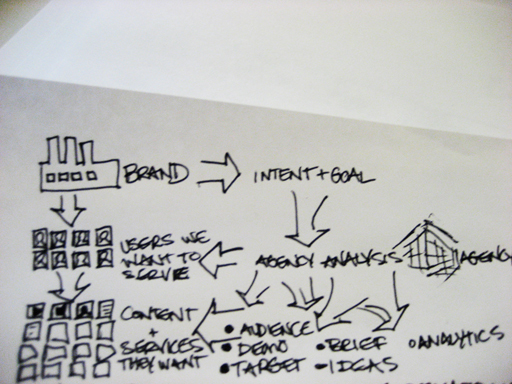 A site map is representative of a design solution. It’s a handy design inventory. It’s not a starting point. In my mind, a lot of the “good stuff” happens before we have a site map. Sure, designing the individual interfaces is fun, as well…but, the journeys and over-arching narratives are key to nail down before we do those interfaces. I think this goes for representative “comps” and “design directions” as a representative slice of the solution – let’s get better at designing experience concepts, as an industry; we don’t spend enough time there, I fear. The backgrounds for these last slides of the section are scenarios and scenario maps – early site maps that evolve when we overlay several scenarios (scenarios are user segment + user need + narrative user story (of fulfillment/experience) + lo-fi UI’s. I’ll come right out and let you know ahead of time that I think this next section is the least-baked. Sorry. It started out as an approach to Experience Design when there are already significant brand touchpoints out there – that by “Growing Organically,” we could meet emerging brand and user needs more quickly by bypassing the tendency to build every new experience in the context of the previous. That’s where that title on Slide 23 comes from, I guess. The cartoon map backgrounds were a deliverable for a big company who had hidden the most important content (according to their some-odd 16MM users) behind some impersonal promotions for prospective customers. These concept maps showed how hard it was to find the good stuff – and I even designed a peaceful town plaza/square to represent the suggested new design. The next bit on Slide 24-25 are remnants of the first section, I guess – maybe it’s a recurring theme. The idea comes from experiencing so many project kickoffs and requirements-gathering sessions where we were collecting “feature ideas” instead of user requirements. It’s not easy, managing the line between requirement and feature – but, I tell you, that line is representative of what I call “Design.” Slide 26 is a shout out to my man Saul Bass. I find it helpful to drop this quote from time to time to define and redefine our activities as Design, even if we’re working at a whiteboard, and not Photoshop. The next little area may be a bit outdated – as I’ve seen so many integrated Creative/User Experience teams as of late. However, in shops where UX is highly-evolved (or devolved?) a divide sometimes grew between Creative and User Experience. My view on the division is best expressed in “Making is Thinking” recent post, “Logic Occludes Intuition.” Basically, it’s easy to slip into a solely performance-based innovation model as a User Experience Designer – trying to “prove” our way to an innovative solution. Slides 27-34 explore some of the differences between the UX and Creative roles (even if they’re occurring in the same person) – and tries to make it OK for UX and Creative to be out of sync for periods of time, while concept catches up with insight, and such. Also, there’s a slide of a blue frisbee where I make a joke about Tron. Hopefully, you’ll get that joke. OK. Yes. I talk about Semantic here. Jumping the shark? Maybe. But, as the Experience Design field advances, and we learn how to measure and discuss the differences between bad experience and good experience across channels, we’re going to need to understand how Ontology Design should affect the design process. With so many experiences leaning so heavily upon good aggregation techniques, landing pages, and contextual navigation, we’ll do well as designers to know that we’ve got to be able to design very fluid experiences that allow people to move laterally (with context, as opposed to vertically “down” in an information experience) in an experience, in units that are smaller than “pages.” Slide 41 is usually when I like to drop a trip through Spock, looking for my favorite Daler Mehndi video, “Tunak” to show how Semantic Tech will change the world – and to show how rad the Tunak video is. Slide 45 basically disallows Experience Designers from straying too far away from practical design, diving so deeply into ontology structures that they forget the “containers” for the experience; pages, modules, templates, screens, messages, videos, etc. The background for this slide and the previous were sketched by Darren Wong, a very talented experience designer in LA. I like the “Context and Container” thing quite a bit – I’ll dive more deeply into that in a subsequent installment, I am sure. So, as I just returned from Memphis and the IA Summit 09, I reflected on this talk that I had put together – and I feel a kinship with Jesse James Garrett, who delivered the final plenary talk on Sunday, when he shouted us out – to rise, and be Information Architects no more – but, to be User Experience Designers (among other great things he said.) Yes, we perform information architecture. No, it’s not all we do. Should it be our job title? Nope. But, that’s just me. Now that you’ve received the fullness of my approach to handling emerging challenges in User Experience Design, you are also relegated to go forth, and do good; design great experiences via storytelling, and not just information science. How’s that feel? It’s an interesting issue – I am sure many have the same question. It’s difficult to balance, much like my well-known distaste for watching sports on television or talking about sports…in juxtaposition with my great love of actually playing sports. A contributing factor to this feeling, I think, was the amount of “media fatigue” I experience when I turn the TV news on, look at mainstream media news websites, and the like. 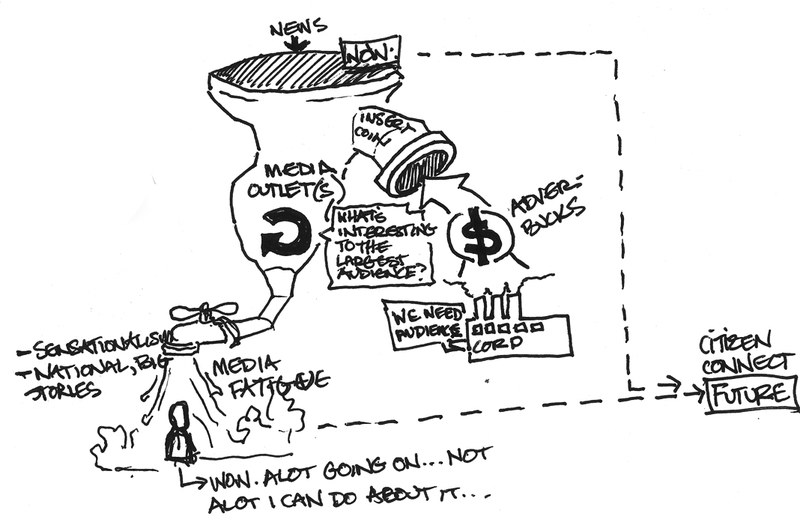 In an effort to keep eyeballs in large numbers on the media (and keep the advertising dollars in the pipe), editorial choices seem to me, strictly as an observer, to focus on BIG BIG events, topics, widespread, well-tread ideas, and incendiary approaches to covering “the news”…tried and true approaches to engaging audiences, I suppose. Maybe local advertising will save us from this pattern? I’ve only just scratched the surface on this subject, personally – I am sure there are more comprehensive descriptions and discussions on this space – but, I am really enjoying this journey. So, in my quest to personally conceptualize a better experience (and I won’t go into this very heavily…it’s not well thought-out, yet) I started thinking about what’s most important to me from a personal perspective…where did the proverbial rubber hit the street that I lived on? This approach of studying a hierarchy of rights or understanding my duty as a constituent made me feel largely ineffectual. I’m not attending the school board, city council, and other meetings where issues were being discussed…where people were _doing_ things. I needed more time in the day. Then – the scenario became a little clearer to me. If I currently had time to work with the cub scouts, make music, manage music, raise a family, earn a living, and continue growing a meaningful relationship with my wife, it had only become easier via the social tools I was using; Google Groups for the UX panel I was putting together, Google Apps for band-related business (CRM, Calendar, etc. ), email/SMS/Facebook/Twitter for staying in touch with my wife during the day, etc. So – what if being a good citizen was more like Wii fit? What if it was more like using Mint.com? I’d have a dashboard where I could decide, be informed, contribute ideas, volunteer, provide services, respond to and inform my elected representatives – all like i was just payin’ the bills online (as my wife informs me that we do.) I think that I’d spend alot more time and effort in the local, city, and county-level parts of the application…personally – but, I’d work hard to get informed on topics that were reaching across our state, nation, and the world. So, what if we voted every day? What if we could harness the power of social computing (that we currently use to do whatever) to organize ourselves and actually _do_ something. Now, I am certain that many of you are very active in your communities, politically savvy, and making the world a better place, every day. Maybe some of you are already using applications like these. However, I don’t see a lot of this going on, quite yet…and I want to be involved. I want representatives to know what I think and feel, in context to efforts that they’re expending. I have a feeling that those officials would also appreciate tools that would allow them to provide some transparency to their efforts, tools to poll the constituency, and do right by the folks that elected them. Of course, we’ve all been enamored by the newly elected Executive Branch and their use of “My Idea”-type dialogues with the nation. I have to be honest; it’s awfully crude…compared to the intricacies of human interaction happening every day on Facebook, inside book clubs, and micro-movements that are coordinated using computers to do our social bidding. In fact, a Google Search of “Open Government” uncovers a cornucopia of information about how transparency is coming to government. My humble question is “What’s next – and what can I do to help?” Where should I look for more on this topic? Anyone want to help me prototype this? I’ve been working on how to make our services, as Experience Designers, faster, cheaper, and better. (Good Experience Design for all!) I’ve ran a few agile software development/product development projects in the past, with much help from some great “coaches.” However, there are several major pattern problems with doing what we do in an agile environment. I’m exploring some solutions. 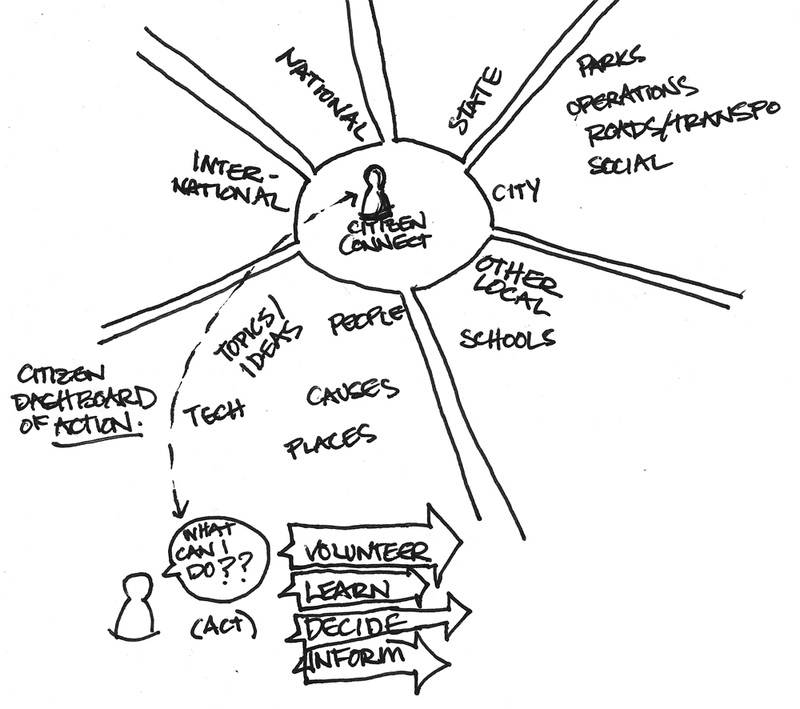 So – what happens when we try to do Experience Design in an agile manner? Well, again, I’m not anywhere near complete, yet. But, here are a few sketches and ideas. More to come. 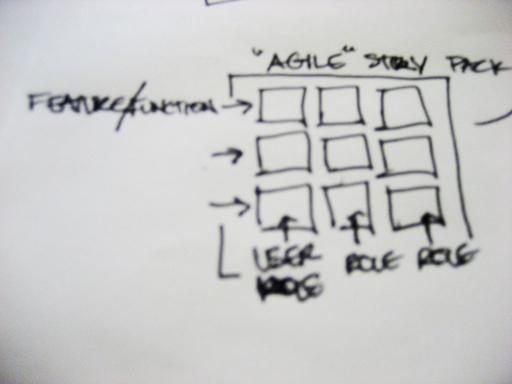 First, what is an agency’s role in Agile Experience Design? Well, an intent and goal should be identified. Plenty of companies already know how to do this – and do it well. Once we know intent and goals, we can go after describing our target audience, demographic attributes, targeting strategy…we write a brief…or several of them, we document our impressions and ideas – and there’s usually a fair amount learned from analytics. So – with intent and goals clarified, we should be able to provide audience information and start forming ideas around what kinds of content and/or services will be provided to the audience. Now – when we’ve got an ongoing relationship with the client, we can do this continually. If we’re just doing a project, maybe we do this once. Maybe we get real lean about doing this, if we’re constantly doing projects. So, in a waterfall situation, we might take that first step, and make it a big Discovery period…hoping to set a scope for the rest of the project. What if we did it constantly – or iteratively? Well, for one, all those briefs and ideas and targeting and such…well, they take time. I haven’t tackled it here, yet…but, I’ll be digging into what this service model might look like, if we were more agile. I’ve been trying to keep these to 6 steps or less…instituting a rule that anything bigger must be a series of needs. I also have high fidelity versions of these…but, I’ll share those some other time. So, we take our scenarios – and we do a bunch of them. We have the stakeholders, product managers, and other personalities help prioritize these. 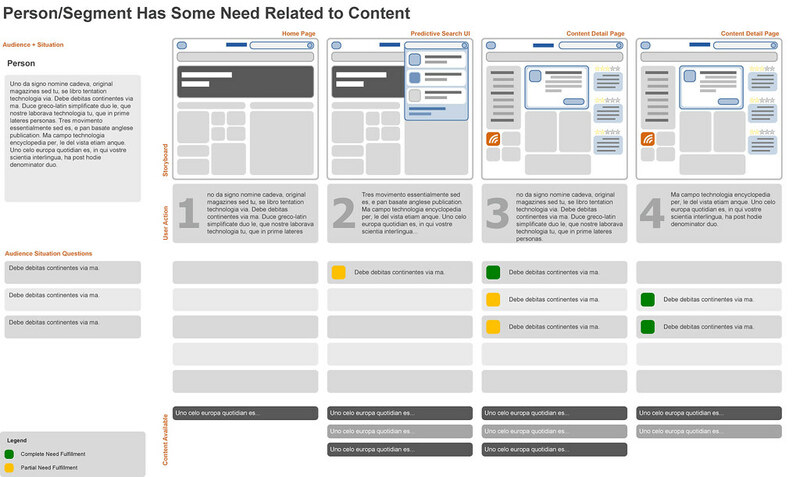 These are great, because multiple scenarios can use the same UI, page, or feature…but, each stakeholder group can describe their audience, content, or service differently, from story to story. 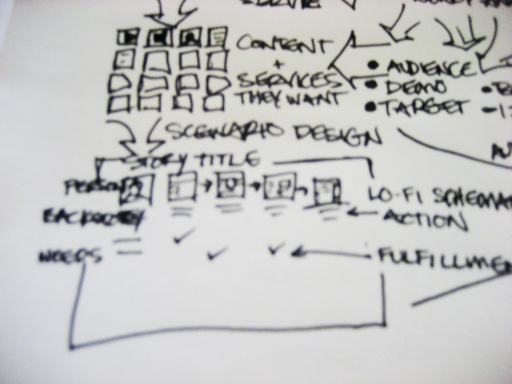 Scenarios are a way to “show our work” in experience design…and they’re pretty lightweight. Once we’ve got enough scenarios to describe the features that would make up an Agile Story, we can group them as packages – and we’ve got the beginnings of something we could give to a presentation layer developer/designer. Better. Getting to market earlier, observing, and tweaking means learning more about what people love and hate about the experience you’re delivering. Also, Agile (not sure why I’m capitalizing) means making decisions, allowing for change (requiring it between cycles, in fact), and probably NOT building (ever) the lowest priority feature that would otherwise be in scope…you see, if it’s low priority, it won’t make it into an iteration…everyone has ideas constantly – and chances are, better ideas will come along, and cause those lower priority features and ideas to remain out of the product. Software Darwinism? How do we estimate for it? Is it right for every project? What does the perfect dev handoff look like? Any great examples out there of leaner design approaches? Anyone working in an agile environment for experience design? I’m interested in 4 things this year (it seems like it’s always 1, 2, 3, or 5 things, right? Never 4…or 6. At that point, you should just go for a Top 10 list, I think.) In the coming year, I hope we can stop talking about Social Media in Social Media and start discussing a wealth of successes in the field – giving customers the kind of experience they want – connecting people in new ways. Yeah. Crowds, Markets, Conversations, Tribes, Organizations without organization…there’s plenty of speculation and related ruckus in the market, as social media gets more and more attention in traditional PR circles (and vice versa). Great little book by Seth Godin about Tribes…not related to Crowds in this sense; it’s more about Leading From Where You Stand – and doing what you love (yeah, it gets a little preachy). I’m talking about Crowds in a sense of topical relevance; a crowd is a group of folks that are actively taking interest in a specific topic. Near the center of the crowd, you might find the Elite – people making, creating, thinking, dreaming…putting “art” into the market, relevant to their crowd. A crowd may be assembled around nearly any topic; Robotics, Skateboarding, Current Political Events, or Kittens. Skill and knowledge that’s native to the topic are highest in the center. Spanning out from the center of the crowd, you’ll find decreasing expertise and knowledge (and interest) in the topic. The more specific the topic, the smaller the crowd, probably. The more inclusive and expansive the topic, the larger the crowd…and more difficult it might be to find the center. 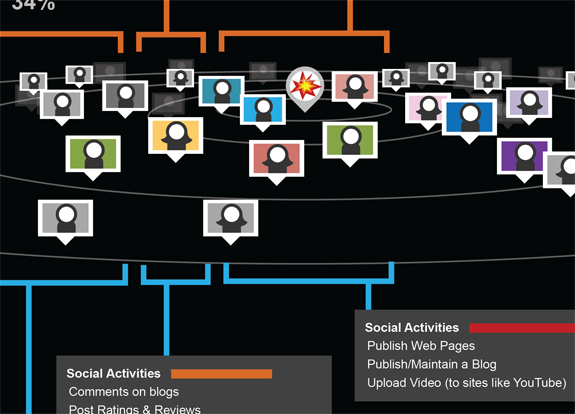 Here’s something you’re probably familiar with: The Forrester NACTAS “Social Technographics Ladder” thing. Here, I’ve put it on it’s side, and put it in the context of a crowd. I’m interested in how folks interact in the crowd. I am interested in the activities of a crowd, based on topic. Figure 1: Anatomy of a Crowd. Click for big version. Here’s the thing about that Forrester chart…it’s only kind of right. It describes people across the board as “Creators” – when, in reality, I’m a creator only in respect to a few topics…not everything. So, how do I, as a person…and as a brand, go about understanding the roles that people play in specific topics (NOT markets)? I think observation of crowds, and the dynamics at work there will help understand how ideas flow through crowds. This ladder on its side only plots behaviors. I’m going to work on visualizing the dynamics between the divisions of crowd members – and mobility from one group to another. I have a feeling there will be elements of Dale Carnegie’s famous book at work here. Figure 2: Reputation Powers Sharing. Click for big version. I’m going to look at some blue sky and practical methods for gathering reputation information. 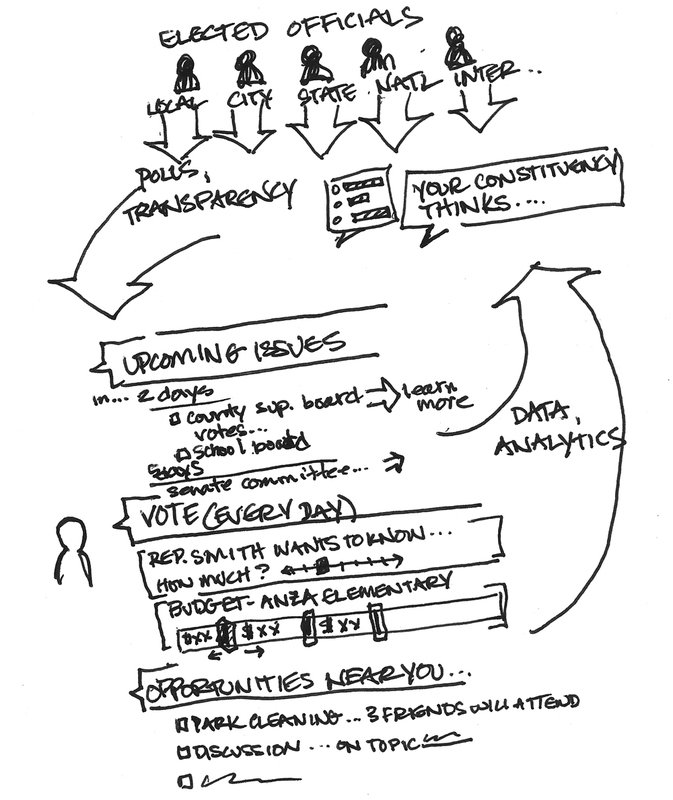 Blue sky ideas like an aggregated view of sharing, including Word of Mouth (! ), phone, text, tweets, Facebook, email, blogs, etc. Practical ideas like ad network cookie data and recent innovations like Bit.ly’s click-counter browser plug-in. I think a new model for dealing with reputation will not only help people Convince and Convert (go Jason, @jaybaer) markets and the people in them…it will help us understand how to measure, find, and propagate the best and most important ideas throughout the world. So, any given brand is at the center of any number of crowds – crowds don’t always revolve around a brand…but, good brands are usually very much in touch with the crowds that are relevant to their product/service. A TV show might appeal to drama fans, sci-fi fans, and readers of short stories for teens. A footwear product might lie at the center of a light cross training crowd, people who jog from time to time, runners, and people who walk to work. Now, maybe those aren’t crowds because they don’t have any group participation…maybe they’re just demographics, targets, or something like that. I’d like to have something better than ‘target audience’ to work with when I want to get an idea out there – I want to know the dynamics of the crowd, the specifics of reputation there, and I want to know how to behave myself there. Maybe kind of like getting a sense of the dress code before I go to a party? Here’s how to get a “dress code” for the topic/crowd’s you’re pursuing – great post by Marshall at Read/Write/Web. Figure 3: Brands in the Crowd Universe. Click for big version. In the coming year, I’ll work on my definition of crowds – in the context of a brand…and how brands. I think that brands that understand their crowds in an honest and participative manner hold them most gravity in their specific markets – gravity that they turn into revenue, loyalty, and other really important things. OK. This one goes a bit far – but, there’s real value in understanding how the concepts of reputation and crowds affect the success or failure of specific campaigns, marketing tactics, and messages. I want to understand how topical relevance, honesty, and inspiration are all perceived by crowds – and maybe develop a visualization of an accurate logical model of campaigns, their dispositions in specific crowds, the perceptions of the crowds, and the results of the campaigns. Should be fun. Figure 4: Gravity of Interest; Operational vs. Topic. Click for big version. I think a divide is developing between Operational and Crowd Experiences. Everyone is finding themselves a part of a niche, developed based on the immediate availability of very detailed information…not to mention the ubiquity of communication platforms for folks to exchange thoughts. There’s more to it, but – when a company floats a message out there with very little tie to something that’s interesting to a specific crowd, it better be about giving me Chai Latte…otherwise, it’s just out there…in the noise of the market – left to fend for itself, along with the other corporate messages of the world. It’s cold out there, in the vast expanse of communication topics, without the warm, insulation of loyal activists, enthusiasts or built-in interested parties. So, four things. It’s unheard of, I know. But, that’s what I’d like to work on this year. I’ll keep the visualizations, pictograms, diagrams, and findings coming throughout the year. If you’ve got something to add to this, I’d love to see it. Should be interesting.